Venue Menu, a menu of venues that makes it easy for people to search, browse and find Perth’s most interesting locations for events from dinners to weddings and photo shoots to band practice. It’s exciting developing software for start-ups, and also high risk. We collaborate with the key stakeholders of the product to document and a clear vision and then scope a minimum viable product for launch. When they find success, the technology can be evolved to include bigger and better features. We were asked to design and develop a website that takes a different approach to venues marketing. 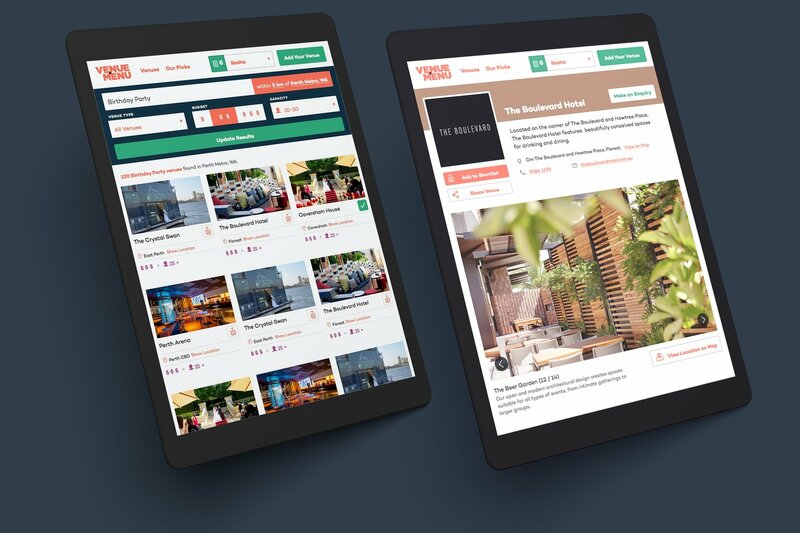 Backed by custom software to facilitate the management of venue content, Venue Menu offers venues best practice digital marketing and consumer engagement. The site presents images, points of difference and sales content with simplicity. 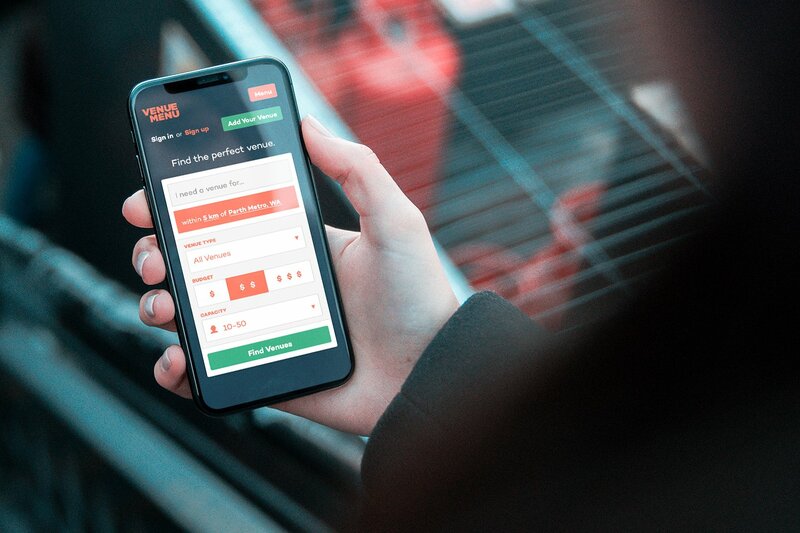 For consumers looking for venues, Venue Menu delivers fast and intuitive search and filtering functionalities and multiple opportunities to connect with venues. Software for startups, Where to start? 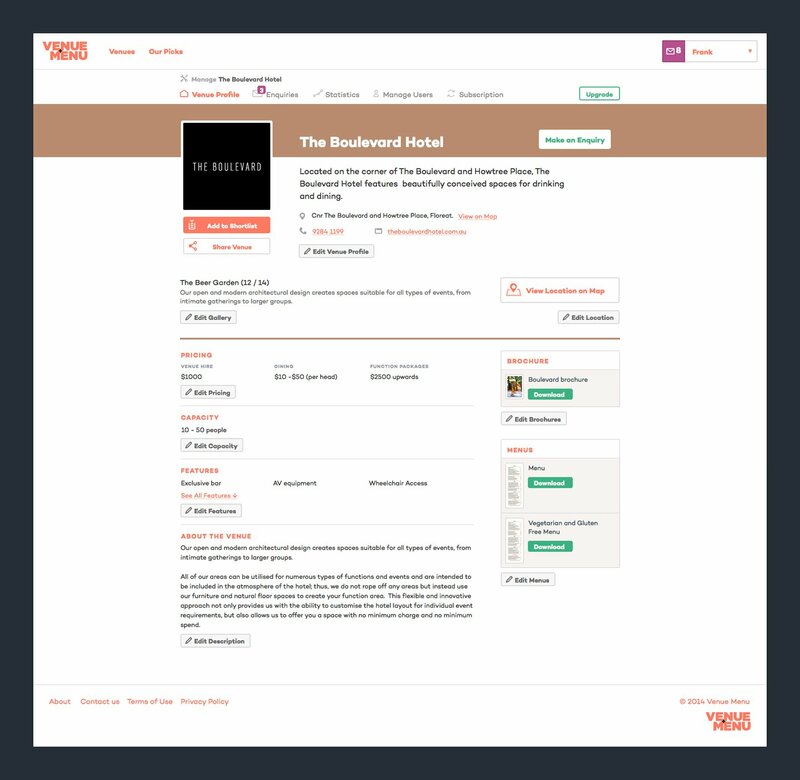 The Venue Menu project takes us back a while, but even now, a good few years later, the interface design and the content management functionality of this software application has stood the test of time. This story starts with an idea that wasn't ours. We were approached by a young couple with a passion for the idea of putting the vacant spaces of Perth to use, by sharing them via a website. We worked with them to evolve the idea and stay true to the initial concept while building in the chance to turn the idea into a digital business with clear revenue options. And so Venue Menu was born. We started with the concept and the business model, then moved to finding a 'sticky' name, and then the fun really began. Venue Menu is a purely digital business, fronted by the website that you can see, and backed by custom software that was developed using Python and Django, specifically to enable the listing of venues, and the management of the marketing content that features on the website. As with most online businesses, there were two user groups to consider here. The venue owners, and the end users, the people searching for venues. The people searching need to connect to venues quickly and easily and be able to search by factors that are important to them like location, price, specialisations and special offers. For the venues, they need to be able to upload and manage their content simply and easily and have their venues presented in the best possible way on the website and across all devices and screen sizes. As a software application, venues can edit their content inline, removing the need for a separate management area. 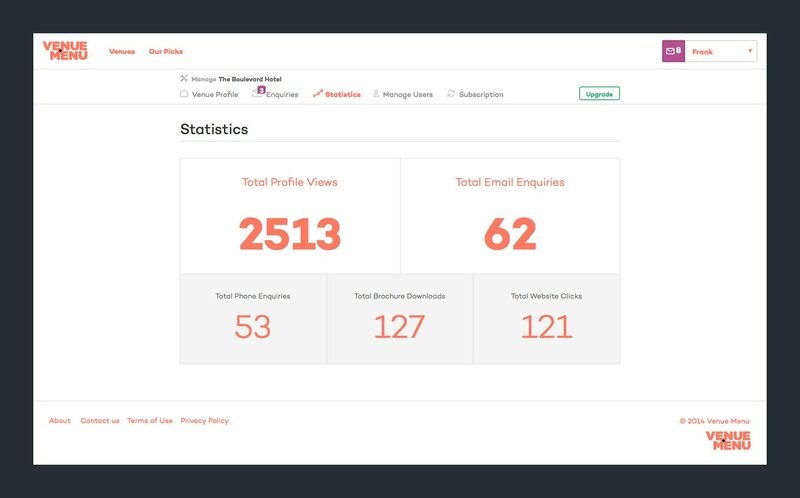 The platform also stores enquiries and tracks engagements, all accessible via secure account logins. For the people out there searching for venues, we designed an interface that is as simple and as intuitive as possible, and works just as well on mobile as on desktop.